Hometown: Clinton Township, Hunterdon County, NJ. Cape Cod, MA at the time of his death. 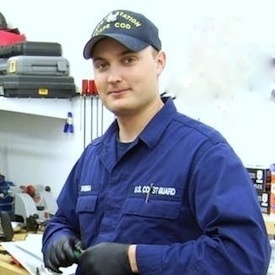 Jeffrey M. Svoboda, 25, formerly of Clinton Township, NJ, died while serving with the United States Coast Guard in Massachusetts. Born: in Raritan Township, NJ, May 14, 1985, he was a son of Michael Svoboda, Sr. of Flemington, NJ and Patricia Harper Bye of Lacey Township, NJ. Personal: He was a 2003 graduate of North Hunterdon Regional High School, Clinton Township, NJ. He was an avid motorcyclist, fisherman, and boater. 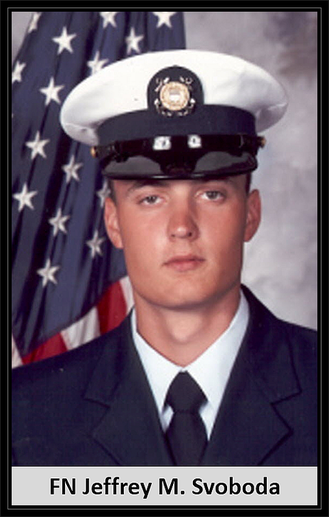 He had been serving in the United States Coast Guard for seven years, and was a highly decorated veteran. He was currently serving as an EE3 Fireman/ Military Law Enforcement, Cape Cod, MA. ​Survivors: Surviving are his father, Michael Svoboda, Sr.; his mother and stepfather, Patricia and David Bye; two brothers, Michael Svoboda, Jr. of Jackson, NJ, and Daniel Bye of Lacey Township, NJ; his aunts and uncles, James Harper of Holland Township, NJ, Thomas Harper of Milford, NJ, Timothy Harper of Holland Township, NJ, Teresa Yerian of Califon, NJ, Cheryl Svoboda of Doylestown, PA, and Emil Svoboda, Jr. of Flemington, NJ; and fourteen cousins. He was predeceased by his maternal grandparents, James and Doris Harper, his paternal grandparents, Emil and June Svoboda, Sr. and John and Marilyn Bye, and his uncle, Ronald Harper.